There are probably a few critics who would love to kill Aaron Behrens—the more painful the better. Maybe some slow torturing. Or one of the medieval things that resulted in—well, let your imagination go. Just as long as it hurt—a lot—and got results. Because, for some reason, they hate him. 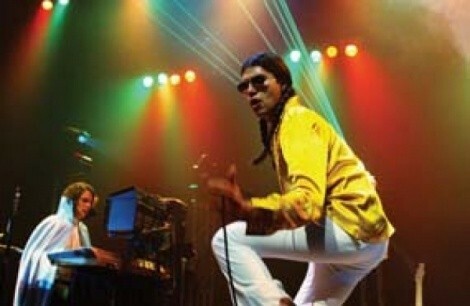 They hate the way the Ghostland Observatory frontman sings. Hate the way he struts around on stage; how he always has his hair in two thick braids and can’t seem to live without his CHiPs sunglasses—and how fans can’t seem to live without him. Critics have tried to discourage the cult following. Online indie tastemaker Pitchfork described Behrens’s voice as a “fairly good bar-band approximation of hair-metal timbral wankery.” Ouch. Rolling Stone wasn’t much nicer, writing off the band—Behrens and keyboardist/producer Thomas Ross Turner—as pretty much bloodless electroclash. And indie blog Backbeat basically said the group was so vacuous that it would probably spark the second coming of some substantial music, like grunge or real metal. That could leave a scar—and those are just the printable ones. There’s some truly nasty stuff floating around the Web—all of which makes Behrens giddy. And that doesn’t even take into account the music. It’s like an ’80s supercomputer going supernova—which is what drives a lot of those critics nuts. All that pomp will usually get a band only so far. There’s supposed to be some sort of substance backing the flash. In the case of Ghostland, though, all you want—or need—is the flash. Real depth might ruin the group, actually. Partially because Turner’s Casio symphonies are so perfectly Atari—cold, pixilated pulses of sound like leftover soundtrack clips to some bad ’80s videogame—and partially because Behrens sings like Freddie Mercury with a stomach flu, howling out his usually indecipherable lyrics like he’s purging his system of something fully awesome and toxic. And while that might initially sound as wrong as a Barack and Hillary mack session, it actually meshes into something so superficially fun and funky—electro dance funk soul, as the band calls it—that you don’t give a damned about deeper meaning or crisp songwriting. Take “No Place for Me.” Buried deep inside Ghostland’s third disc, Robotique Majestique (Trashy Moped), the track is all posturing. Turner has the keyboards set to meat grinder. The programmed beats squelch as much as they thump. And Behrens sings like he’s channeling Rob Halford, piling on as much pseudo-tough as he can. Or “Heavy Heart,” which is pure disco preening. Or “Dancing on My Grave”: An ’80s flashback that boils in Thompson Twins pulses. All of them probably have some serious undercurrent to them; what they are, probably only Behrens knows. But they’re so damned fun that you don’t care. You just want to put on a cape and get onstage yourself. “That’s the thing that is great about all this,” he says. “We’re all so stressed. You read the papers. You watch the news. You hear you should go green but you don’t know how to go green. Are you a good person? Are you politically conscious enough? All of it gets piled on us, and we need to let go sometimes. I know I do. And that’s why this works. You can let is all go. You can just dance and release it all. Hell, Behrens even would let the critics join in if they want to—unless, of course, they’re too busy trying to kill him.